"I was partial to unhappy endings." Another debut novel bought for my summer readfest of peachy beachies, You Are One of Them is definitely something new and different. Ultimately I see it as a coming-of-age/self-realization story, containing an ongoing examination of friendship and loss, loyalty and betrayal, set largely in the Cold War years but jumping on into the later 1990s. In this novel, defection is a key term, used in a political sense as well as an emotional one. The story is told via first-person narrative from the viewpoint of Sarah Zuckerman, presently in Moscow as a journalist. While it's not my favorite novel this year, it's definitely a good read and absolutely perfect for summer. 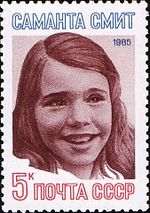 Back in 1982 there was a little 10-year old girl named Samantha Smith, who wrote a letter to then General Secretary of the Communist Party in the USSR Yuri Andropov. She wanted to know if he was planning to vote for a nuclear war against the US. Pravda published her letter, and some time later, she received a letter back from Andropov who invited her to come visit the USSR. She and her parents went there in the summer of 1983 for two weeks, during which time they visited Moscow and Leningrad. Samantha also stayed at a Young Pioneer camp, where she made a good friend who spoke English very well. After coming home and enjoying a great deal of press coverage as a Goodwill Ambassador, Smith and her father died in a plane crash two years later. In You Are One of Them, set in the same time period and beyond, two girls write a letter to Yuri Andropov -- and one goes to Russia. That trip will have profound implications for the one left behind. Sarah Zuckerman has suffered a number of "defections" in her life -- starting with her sister's death. In 1980, "the summer of the Moscow Olympics," and the subsequent boycott that signaled rising tensions between the two countries, she becomes friends with the little girl who moves in next door in the Washington DC neighborhood where she lives. To Sarah, Jennifer Jones has a normal family life compared to hers -- Sarah's father had moved out a year earlier (the second defection). Her mother suffers from all sorts of paralyzing fears, had panic attacks that could be triggered by mundane things, but most especially by the thought of nuclear annihilation, leading her to become an wholehearted anti-nuke activist and to convert their basement into a fallout shelter. Sarah and Jennifer become best friends, doing everything together, and by the time they're in fourth grade two years later, both decide to write to Andropov à la Samantha Smith. It isn't long before Jennifer is invited to the USSR, leaving Sarah behind. After Jennifer's return, as the two girls get older, Jennifer becomes the popular girl while Sarah is once again left behind, and one day in 1985, in seventh grade, Sarah learns that Jennifer and her entire family have been killed in a plane crash. Fast forward ten years later, and Sarah receives a letter from Russia from a woman who claims to have been good friends with Jennifer during the USSR visit. The woman invites Sarah to come for a visit to Moscow, and tells her she can organize a "special tour;" later, an email to Sarah in response to her questions asks Sarah how does she know Jennifer is really dead? After all, in Russia, "news is not truth." As Sarah makes her way to and through Moscow, she reveals the stories of the girls' friendship, her own life growing up, and ultimately what she discovers about herself during her journey. There are some wonderful moments here, especially in the author's descriptions of Moscow (although I do have to say that if you've ever read Snowdrops by A.D. Miller, he does it much more vividly). She is also very effective in linking together both personal and political suspicions on both sides during and after the Cold War. Her best work, however, is found in terms of Sarah's character. She comes across as a person believably pained, unmoored, filled with loneliness and loss, and exuding a kind of vulnerability that never lifts throughout the novel. But somehow, I was left a little unsatisfied -- towards the end I felt like the author was rushing to get to the end of the story, and after the big buildup of the girls' friendships during their childhood years, I'd expected much more in terms of the novel's climax, for reasons that I can't explain without giving away the show. All in all, though, the book was a good summer read, one I probably wouldn't have picked up had it not been beach read season, but one that I'm glad I did. 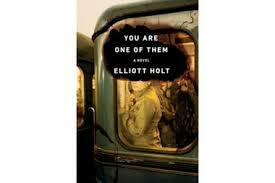 Amazingly, it's the author's first novel, and one I can recommend, especially to readers who like keeping it casual.